We’re already a month into the new year, how’s your job search going? Refresh your job search and apply some new strategies. 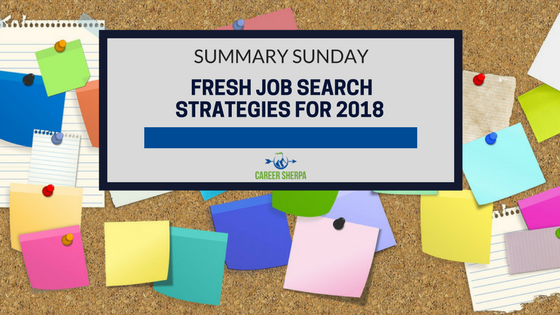 Fresh job search strategies include submitting an ATS-friendly resume, a robust LinkedIn profile, and taking a proactive approach to your job search. All these are spelled out in the articles I shared this week on social media. They did so well, I’m featuring them here. Not getting contacted after you submit your resume? Are you putting your contact info in a header? Are you using fancy fonts or charts? Common typos can even hurt your chances. Learn how to easily fix common resume mistakes. In this article, Will talks about how defeated he felt during his job search. Most job seekers feel this way. It’s a painful process. He shares four things you can do to shift your job search strategy and feel like you have more control. Your LinkedIn profile is too important to ignore! If it’s been awhile since updated it, use these 10 tips to spiff up your profile! Call it a gig, extra-income or testing your entrepreneurial savvy. It’s crazy to put all your eggs in one basket (one job). Explore some of the options in this article. At the very least, give the idea of a side hustle some thought! How well have you mastered these skills? These will make you a better employee, a better team member, and a better choice for the job.